The most basic safety precaution is the life jacket—what paddlers refer to as a personal flotation device (PFD). There’s simply no good excuse not to wear one. Think you’re a great swimmer? Those abilities won’t help when you’ve been knocked unconscious with the weight of 2,000 cubic feet of water per second forced onto your chest. A good PFD also helps protect a paddler’s body from hard objects and provides thermal protection. So wear one. No excuses. Whether it’s Class II water or Class V, every whitewater boater should wear a helmet. If you want to know why, take a look at a veteran paddler’s helmet—each one will have scratches and gouges. If you can only spend money on a few pieces of gear, don’t skimp on your PFD or helmet! And be sure to keep it on near the river bank, because slips and falls happen there all the time. The river is full of sharp rocks, sticks, fish hooks, old rebar and other dangers. Wear a river shoe that has closed-toe protection—and save the Chacos or flip-flops for around camp. Obviously, if you are boating on an August day in Arkansas, dressing cool is important. But don’t forget about water temperature! If the sum of the outside temperature plus the water temperature is less than 120 degrees, you will want to wear thermal protection in order to prevent getting hypothermia. Long-sleeve clothing can help with sun protection. And as temperatures drop, wetsuits, drysuits or other thermal clothing will be needed. When surrounded by loud whitewater, a whistle can be invaluable as a communication tool. Whistles are much louder than the human voice, and there are standard whistle signals that can be used to alert others that you are in trouble. A knife is also a must-have. Be sure to get one with a stainless steel blade to avoid rust. For a light jacket that provides protection from both wind and damp, look no further than the i5 Crosswind. Won’t hold water, so it will never weigh you down! Available in a variety of test weights and colors, J-Braid is top-notch when it comes to line. After all, getting them on the hook is just the first step. 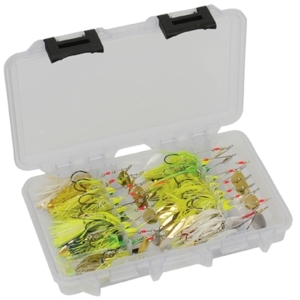 The Plano FTO Elite series of small tackle boxes are perfect for the limited space available to the kayak fisherman, and come in different styles for various types of lures. Looking to invest in a rod that will potentially last a lifetime? Falcon is the name. Check out their new-for-2017 BuCoo SR series and discover unparalleled strength in a lightweight package. The Triumph 13 Angler from Perception Kayaks is the ultimate in kayak angling perfection. Fast, agile and built with the kayak fisherman in mind, you’ll be reeling them in as quick as you can get your bait in the water. The Karma Kayak from Jackson Kayak handles whitewater with ease and comes fully loaded with rails to allow easy accessory attachment. This lightweight paddle from Aqua-Bound will get you moving with a high-tech, carbon fiber blade to provide extra strength and stiffness. Take off in a hurry with the Aero SUP package from Jobe. Includes a lightweight inflatable board, paddle, air pump and carrying case. Perfect for a beginner! Keep your valuables safe and dry with this inexpensive waterproof pouch by X-Stream Paddle Sports Gear. Great for cell phone protection, this case by Pelican also comes with a clip to keep it attached and easily accessible. What better way to keep the sun out of your eyes on the water than a pair of shades—especially these foam-enhanced glasses from Bomber Eyewear that float. The Ozarks are home to some of the best paddling in the country. This guide by Arkansas Canoe Club instructor Tom Kennon will get paddlers on the water in no time. This weathered cotton hat from Dorfman Pacific is perfect for protection from the sun—plus it’s durable enough to get wet. Stand Up Paddleboarding is being discovered all over the world by surfers, canoeists, fishermen and anyone who enjoys being outside on the water. The upright perspective, glide through the water and minimalist approach make this sport appealing to a broad spectrum of people, and Arkansas’ bounty of lakes, rivers, creeks and swamps is a “SUP” paradise. The growing popularity of SUP is easy to explain: It’s fun, easy to learn and accessible. Just grab a board, paddle, leash and life-jacket and you’ll be checking out your nearest lake or quiet river in no time. SUP riders take on rivers of all sizes—including the Arkansas. Standing above the rush of water on a SUP is a unique perspective. Arkansas waterways can be swamps, lakes, a lock and dammed river system, flatwater river sections, or whitewater rivers and, in general, trips are either flatwater, whitewater, or mixed. Short flatwater trips are the best place to begin getting used to the board and building up comfort and skill level. Beaver Lake, Lake Ouachita, Lake Greeson and the Arkansas River are just a few of the hundreds of waterways that are great places to start. Remember to let someone know where you’re going and when you plan to return. Arkansas is especially beautiful when viewed from a Stand Up Paddleboard—so get on the water and enjoy! "The growing popularity of SUP is easy to explain: It’s fun, easy to learn and accessible." Arkansas’ whitewater rivers like the Frog Bayou near Rudy make for a thrilling SUP ride.